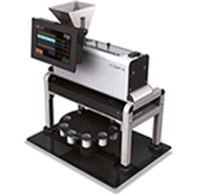 Seed Counter : The Seed Counter is specifically designed for the needs of seed breeders and agricultural research companies. Seeds as small as 0.7 mm up to 25 mm can be counted quickly and accurately with a speed exceeding 22 seeds per second 200 seeds per second! This innovative technology allows counting with an unprecedented accuracy rate of nearly 100%!. Laboratory thresher : Laboratory thresher for use with individual plants, bundles and small plots: a wide range of crops can be threshed from very small vegetable seeds to large beans. It is suitable for threshing, de-awning and cleaning cereals, pulses, vegetable seeds, clover, grass, rice, etc. without breakage, loss of seed or mixing. Liquid seed treater : Liquid seed treater it is possible to treat different quantities of seed using three different sizes of seed bowls for small quantities (20 – 3000 g). and particularly suitable for batch dressing and coating for larger quantities of seed in batches (up to 10 kg).